Grill to perfection with engineered quality at an economical price from Napoleon. The Napoleon Prestige 500 natural gas built-in grill has four stainless steel tube burners that provide up to 48,000 BTUs of cooking power. The grill has 500 square inches of main cooking area and 260 square inches of warming area for a total of 760 square inches of cooking area. The Napoleon electronic Jetfire ignition with crossover lighting starts each burner individually for a reliable start up every time and allows you to light all the burners at the same time. The 7.5 mm stainless steel iron wave cooking grids create the trademark Napoleon sear lines and allow for better heat retention. The dual level, stainless steel, sear plates vaporize drippings, control flare ups and keep your food moist. The Prestige P500 also has a 18,000 BTU stainless steel rear infrared burner and rotisserie kit for roasting. The hood features an Accu-Probe temperature gauge and retains heat for oven-like performance. The grill hood also utilizes gravity-centered technology for easy lifting and space saving. Easy set, soft touch grip, ergonomic, control knobs make grilling easy and clean up is a cinch with the full width removable drip pan. The grill cart is made of durable, rust and corrosion resistant black enamel and galvaneneal, features folding shelves with integrated utensil holders, double doors for storage and easy roll locking casters for moving the grill around. This grill also comes with an exclusive Prestige All Season Cookbook. Cooking Grid Dimensions 28 X 17 3/4"
Napoleon offers a Presidents Limited Lifetime Warranty. The aluminum castings, stainless steel base, stainless steel lid, porcelain enamel lid, and stainless steel cooking grids are warranted for a lifetime. The stainless steel tube burners and porcelain-enameled cast iron cooking grids are warranted for ten (10) years, plus half off for life. The stainless steel sear plates, stainless steel infrared rotisserie burner, and ceramic infrared burners (excluding screen) are warranted for five (5) years, plus half off for life. All other parts are warranted for two (2) years. We have owned this grill for 5 years and absoultely love it! It's still in fantastic condition with little to no maintenance care from us. I bought this at a BBQ centre. I was very suprised to see one at a local Canadian Tire in the Black and Stainless. I bought this as it was American and not Chinese built. Got the 3/8" round bar grates. this is a good BBQ, but I'm suprised at the stamped top on the Canadian Tire Prestige model and the back lit knobs. Mine has none of that. Also, the plastic ends on the stainless sides are grey on mine and the Prestige is black. I love the cast sides on mine, but have discoloured. Also the first burner is too hot. Love my flavor wave system as it is durable and easy to clean. But to be honest, other than the grate, The one at Canadian Tire looks better. Not as good as I thought! The Napoleon Prestige is a nice freestanding gas grill with innovative accessories and storage features. The Prestige series is available with an infrared rear burner and rotisserie. The P500 has an optional infrared “sizzle-zone” side burner. I love that when the side burner or ice bucket are not in use, the lid is flush - giving you full access to the side shelf space. You can also add a charcoal tray or smoker tube giving you several different ways to cook. The Napoleon Prestige comes with blue backlit control knobs. The control knobs have SafetyGlow technology that changes the backlight color from blue to red when a burner is in use. I also really like Napoleon’s doubled lined “lift-ease” lid, which opens easily and helps hold in heat for optimal heat retention. The lid is hinged near the middle and, when open, adds hardly any depth to the back of the grill. This allows for easy placement in a variety of spaces. Napoleon Prestige grills have stainless steel tube burners that are lit by a "Jetfire" electronic ignition. 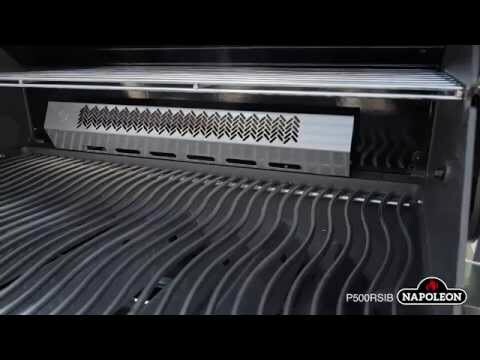 The P500 comes with stainless steel grates which have a patented wave design that creates unique sear marks to spread heat evenly, Napoleon has stainless steel sear plates. The plates also protect the burners and help reduce flare-ups. The P500’s infrared “sizzle-zone” is a unique feature on this grill. Its grate is adjustable, allowing you to change the position of the grates. You can lower the grates to the burner for cooking with pots and pans as you would on a conventional side burner, or raise the grates to a higher position for searing meats like steak. The Prestige 500 is also available in a built-in model, which would make a great centerpiece in your outdoor kitchen. The warranty on the Prestige series is a standout in its class, having a lifetime warranty on the exterior housing, cooking grids, and porcelain enamel coated lid. Napoleon also boasts a 10 year + 5 warranty on their burners and flame tamers that provides replacement parts at a 50% of normal cost for 5 years after the 10 year warranty expires. While this grill is built tough, and backed by a strong warranty, Napoleon Prestige grills are not "all stainless steel", which is what many customers are shopping for nowadays. Along with the stainless steel components on the grill, you will also find cast aluminum and porcelain enameled steel components too, such as cart legs, back panels, etc. 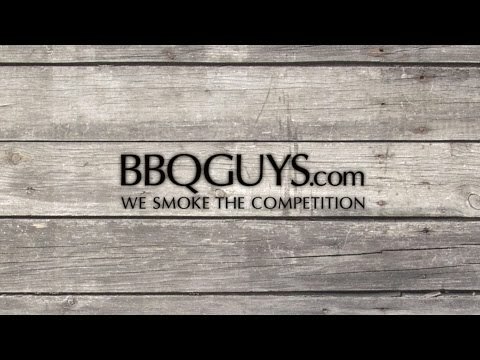 You want a well-built gas grill for the money, made in North America and backed by a strong warranty from a reputable company. 28 X 17 3/4" 32 1/8 X 19" 32 1/8 X 19" 28 X 17 3/4"